« Thanks for the fun! Back in January while Ryan and I visited our Colorado loved ones, I was struck by one of the many talents of my friend Mandy. While enjoying one of our several delicious home-cooked Gibson meals (can I get an Amen, Friends?? 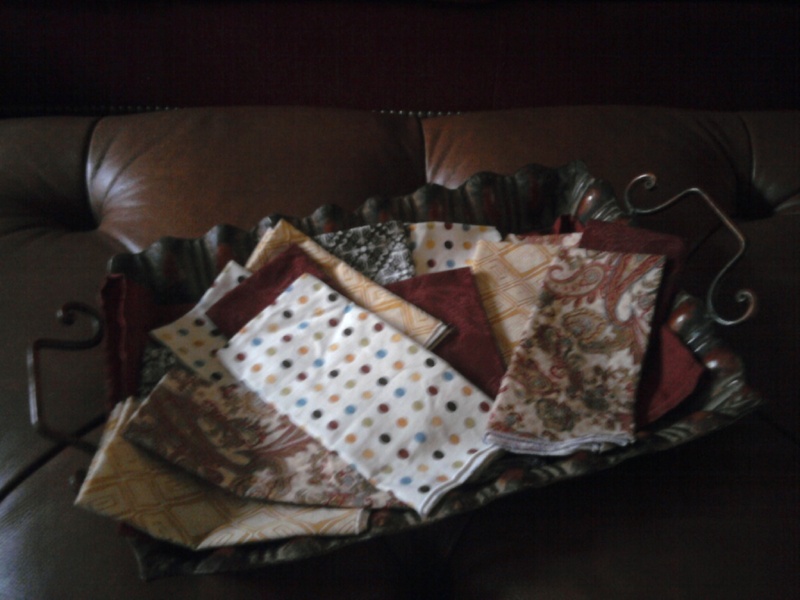 ), I searched for a napkin and was directed to a beautiful collection of colorful cotton delights. “Oh, we use these,” Mandy said handing me a soft, folded cloth. My paper-napkin-only self must have looked confused, because Mandy soon told me a sweet story about her mother collecting and being given several scraps of pretty fabric, and how they had taken those pieces and turned them in to really special napkins. Mandy had sewn them together herself and had her own collection of cotton napkins to be used in her own home. Not only were they gorgeous and unique, but they also served a very awesome and thoughtful purpose. Since they’re reusable, they’re a great way to make a “go-green” effort. Those napkins stuck with me, and when I was able to see my dear friend for a brief weekend back in May, I asked her about them once again. She told me that they were a project that she’d like to help me with and encouraged me to bring some fabric with me when I made my trip in July. Noted! So last Friday Mandy hauled out her machine, did her thread-arranging magic, and guided me through the napkin-making process. I brought some fabric with me, and in addition to those pieces Mandy also supplied some of her own materials that complemented my collection. The final result was terrific! Pardon the graininess. I haven't skillfully mastered my camera phone! I can hardly wait to use them! Thank you, Friend, for helping me make something that I already treasure and for graciously giving me (once again!) your time, your patience, and your talents. Love you!! What a great idea! Bet it was a fun project! Can’t wait to see them and you…. It was great seeing you. I know you will love your napkins. Mandy made me some and I use them all the time and feel very GREEN.